Here is the video of our box break of 2012 Tri City Sports PL Diamond Cuts Baseball. TCSP provided the box for us to open and ran a contest in conjunction with the opening of the box. Spoiler Alert - someone won the contest which makes us very happy. Who won? 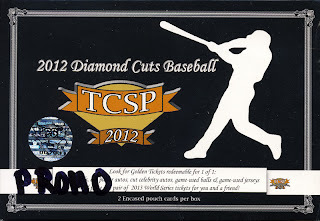 You will have to check the video out to see which cut auto we pulled. The winner is the person who guessed the player's first team and decade the player debuted. A recap and official winner announcement will follow.